That is Lee as in sluggish Tropical Storm Lee, which is meandering across southern Louisiana near the coast this morning. Lee is projected to move across Louisiana and into Mississippi before heading farther north later this week. We had a power outage yesterday afternoon, and plenty of rain has fallen since Friday evening. The water is up in the yard from the storm, but it hasn’t reached the house and isn’t likely to do so. 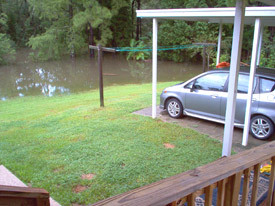 The flooding is nothing like hurricane Katrina, when the entire area in the photo was under water (the side of the house closest to the water is parallel to the end of the carport). The wind hasn’t been too bad so far, and in these storms the rain comes in waves as the bands of the storm system cross the area. With southern Alabama way behind on this year’s annual rainfall, the rain is welcome as long as there isn’t any serious flooding or other damage from high winds. It was raining really hard during the night, and around 5 a.m. this morning sirens went off nearby, but we were not able to determine why. We are under a tornado watch until 4 p.m. local time.